Khirbet Umm el-‘Umdan, located within the municipal boundaries of Modi‘in, was first described by C. Clermont-Ganneau after a visit in 1873, then by C. R. Conder and H. H. Kitchener in their Survey of Western Palestine in 1883. 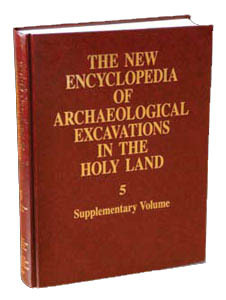 From 2000 to 2003, prior to the construction of a new neighborhood in Modi‘in, excavations were conducted south of the ruin by A. Onn and S. Weksler-Bdolah on behalf of the Israel Antiquities Authority. The finds revealed that the ancient site extended over an area of about 6 a. and was established in the Hellenistic period, at the end of the third or beginning of the second century BCE, then occupied continuously at least until the Second Jewish Revolt. The site, with lanes, buildings, a synagogue, and a mikveh, was identified as a Jewish village. Remains of buildings and agricultural installations from the Byzantine and Early Islamic periods (sixth–tenth centuries) overlay the Jewish village. The latest remains uncovered were graves from the Late Islamic period and a lime kiln that had been dug into the buildings, causing considerable damage.